My dad’s birthday was the other day and he, like me, does not really like cake or other heavy desserts. So, I decided to return to my frozen banana recipes and whip him up something special using it and his favorite fruit: blueberries. It also helped that we had a giant carton of Michigan blueberries in our refrigerator that we needed to use up. 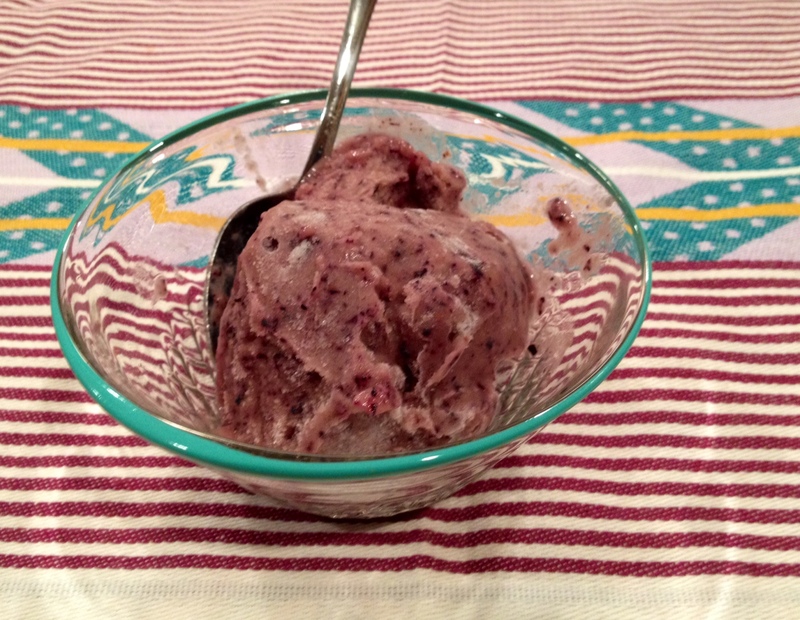 Like most of my frozen banana recipes, this one is super easy to throw together. All you have to do is to remember to freeze the blueberries and bananas at least seven hours ahead of time. Make sure you have any toppings ready to go so as soon as you blend it all together you can serve it immediately before it melts too much. I topped my dad’s with a few fresh berries and served his with graham crackers (he is not gluten free and vegan). I would recommend gluten-free and vegan graham crackers, if you can find them. The ice cream is more of a soft-serve texture so having something crunchy with it is nice. Otherwise, it’s great by itself or with a gluten-free and vegan cookies, such as Lucy’s Ginger Snap, Oatmeal Raisin or Cinnamon Thin varieties. If you freeze it, let it thaw for an hour or so in your refrigerator before serving. It will be a harder consistency if you freeze it. Combine bananas, blueberries, vanilla, cinnamon and almond milk in a blender. As soon as the ice cream is smooth, spoon in bowls to serve or freeze immediately. Top with anything or enjoy it on it’s own.